Aston Villa have sacked manager Alex McLeish after 11 months in charge. The 53-year-old former Scotland manager said his farewells to the club's staff on Monday morning. Villa have endured a poor Premier League campaign, finishing just above the relegation zone after winning only four of 19 games at home. McLeish was an unpopular appointment as he arrived from Birmingham City last year but poor results and performances worsened his relationship with fans. "Alex McLeish's Birmingham City past was irrelevant - his playing style and results did for him at Aston Villa. "If he had won just five of 17 drawn games in the Premier League, the club would have finished in about 10th place and he would have had more time to prove himself. "He ought to have banked more points in the first half of the season, when the squad was at full strength, before injuries and illness dogged him in the last three months. "But losing 22 points from winning positions, coupled with a 9% drop in home attendance and the prospect of poor season ticket sales prompted owner Randy Lerner to don his ruthless businessman's hat and sack the manager he appointed just 11 months ago." 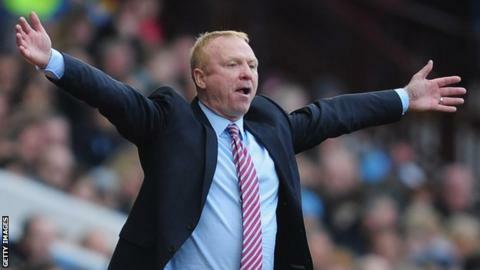 A club statement read: "Aston Villa can confirm that Alex McLeish's contract has been terminated with immediate effect. The club has been disappointed with this season's results, performances and the general message these have sent to our fans. "The board wishes to assure supporters that we are conscious in every sense that Villa expects and deserves more and we will strive to deliver this." Villa chairman Randy Lerner said: "We need to be clear and candid with ourselves and with supporters about what we have lacked in recent years. The early bookmakers' favourite for the job is Norwich manager Paul Lambert, but earlier in the day Canaries chief executive David McNally said he would "fight" to keep the Scot at Carrow Road. McLeish took over from Gerard Houllier in June 2011 but Villa won only seven league matches all season, effectively securing their Premier League status with a 1-1 draw against Tottenham in the penultimate game. McLeish had stints with Motherwell and Hibernian before taking over at Rangers in December 2001. He went on to win two SPL titles in 2003 and 2005. His spell at Ibrox ended in 2006 and after a brief spell as Scotland manager he joined Birmingham in November 2007. McLeish could not avoid relegation in his first season but brought them straight back to the Premier League in 2009. Despite guiding Blues to the Carling Cup in February 2011 a dreadful league run saw them relegated once again three months later. Last week he told BBC Sport that he expected to be in charge of Villa next season and on Sunday said he planned to overhaul the squad this summer.